Works on all devices, including desktops, laptops, tablets, iOS, and Android. I think you’ll agree that the most important chord progressions to study when learning jazz are the major and minor ii V I.These three chords are found in all keys, in many variations, and in just about every jazz standard. While these chords are the most popular in jazz, they often give beginner and intermediate players trouble in their solos. You can run scales and arpeggios over ii V Is, but you don’t sound like jazz, you sound like technical exercises? You have trouble recognizing ii V Is in a chord chart when jamming or practicing jazz tunes. You have one or two go-to licks that you always use over ii V Is, and even then you don’t feel confident with those phrases. You hear great players nailing awesome lines over ii V Is but have no idea how they built those cool licks. If any of these sound familiar, or you’re ready to boost your jazz guitar vocabulary, then this eBook is for you. Whether you’re starting your jazz journey or are an experienced player stuck in a rut, this eBook is for you. Not only do you learn vocabulary that directly outlines ii V Is, you apply everything you learn to jazz standards. This is where real growth happens, applying vocabulary to tunes so you can solo with confidence at your next jam session or gig. This material starts from day 1, and before you know it, you’re running ii V subs and playing cool-sounding jazz lines in your solos. All of a sudden the scales and arpeggios you know come to life and sound like jazz, not like technique exercises. Most importantly, these exercises are engaging, making learning jazz vocabulary fun again. All guitar scales needed to play over ii V I progressions: the major bebop scale, the dominant bebop scale, diatonic pentatonic scales, the altered scale, the Lydian dominant scale, melodic minor scale, Lydian mode, Phrygian dominant scale, natural minor scale, and the blues scales. All arpeggios you need for ii V I progressions + arpeggio inversions, arpeggio pairs, and 3 to 9 arpeggios. Famous jazz patterns such as half-diminished patterns, half-step patterns, the 53213 pattern, and Giant Steps patterns. Substitutions that bring variety and new ideas into your playing, such as the tritone substitution, the bVImaj7 substitution, and Vmaj7 over maj7 chords. Guitar techniques that create interest, such as double stops, octave displacement, pedal tones, and trills. Note choices that make your solos sound like jazz, such as altered notes, chromatic thirds, passing tones, lower neighbor tones, approach notes, and enclosures. Typical jazz phrases, such as the Honeysuckle phrase and turn phrases. b7 to 3 voice leading. This essential vocabulary makes learning jazz guitar fun, rewarding, and is immediately usable in your practice room, on jam sessions, and on gigs. 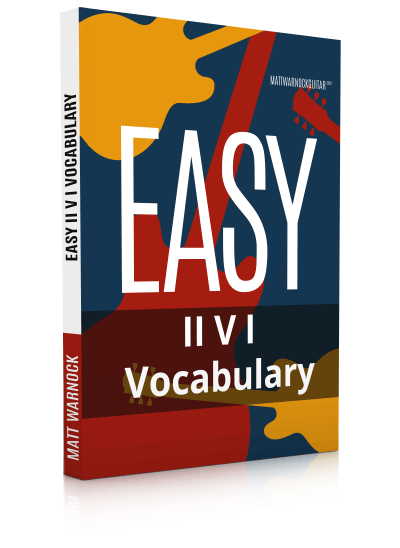 Don’t waste another minute in your practice room, grab your copy of Easy ii V I Vocabulary and reach your full musical potential today! "What if I'm not happy with the eBook?" You will be happy, but in the unlikely case you're not satisfied, you get your money back simple by sending me a mail (in the first 90 days). "How can I contact you if I have additional questions?" Click the blue balloon in the bottom right corner to contact us. I have read many books about how to play jazz guitar. Most of them were good textbooks, except that the authors described how they played the guitar, but did not teach that how others should play. When I discovered Matt’s website and his books, a lot of things suddenly opened up to me in a completely different light. His books and articles are clear, concrete and useful. They are easy to learn, they successfully combine theory and practice. I wish all subscribers good luck in their jazz life, wellbeing and health, and Matt – even more grateful students. Matt, awesome book ! In five minutes after reading the sample, PDF i ordered it ! Though i basically know of the topics covered (well, it doesn’t hurt to go back to basics) it is a life saver for TEACHING. There is a way you have to explain things that make me think that you are a great teacher. Knowing and put in practice concepts is a thing, knowing how to explain them well is another. I always keep on going back to mattwarnockguitar ! Free lessons are awesome too ! Awesome book, your best yet! I’ve always been weak on patterns. Just the resource I need to to turn that around.